Old Man Winter decided to come back for another visit so the Mortroski Midcentury Urban Farm stayed covered up all day today. It’s been below 45°F for the past few nights and this morning it was around 32° during the Gs dark sojourn through the neighborhood. Other than Guinness wanting to catch a possum in the alley right behind the house, it was cold and uneventful. Still when it’s sunny and bright like it is right now, I’m frequently fooled into not wearing a winter coat. I made that mistake many times when I first moved to Toronto from California. When it was sunny, I thought, “hey, it’s going to be nice today” and sadly I would have to get back in the elevator of our high rise apartment and go back to the 24th floor for a coat, hat, and gloves. Trickery! I thought about leaving the house without a coat today, but remembered that Mondays are very unpredictable and I might have to alter my usual home-office-home plan and run out to say, Home Depot, or a lunch meeting. I also remembered my poor garden that had to remain covered all day today since it would only get to 50°F for a millisecond (perhaps right now) and then drop back into the cold temps. If it’s too cold for them, it’s definitely too cold for me these days. And that means no poking around the farm tonight. 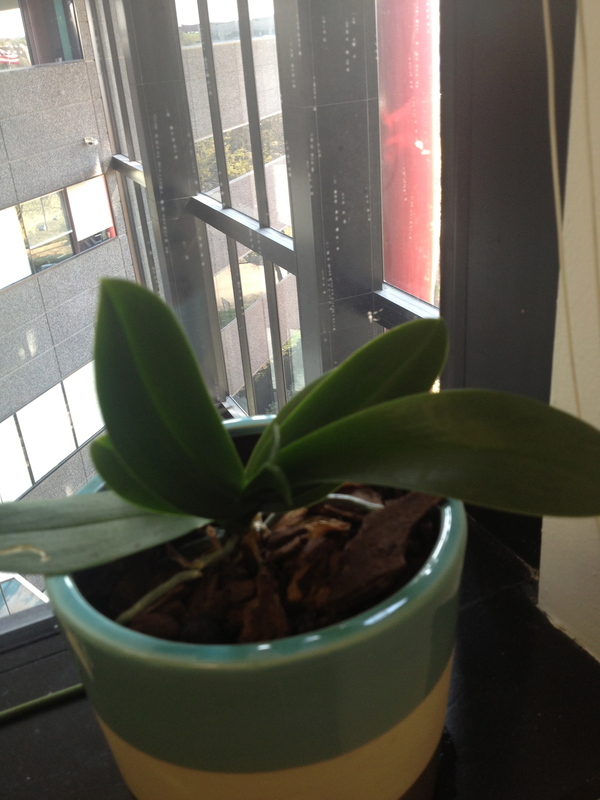 First to arrive: an orchid. While the leaves are lovely and green, I’m not sure it’s going to flower again. The violet seems to like it here a lot and is almost needing a new pot. 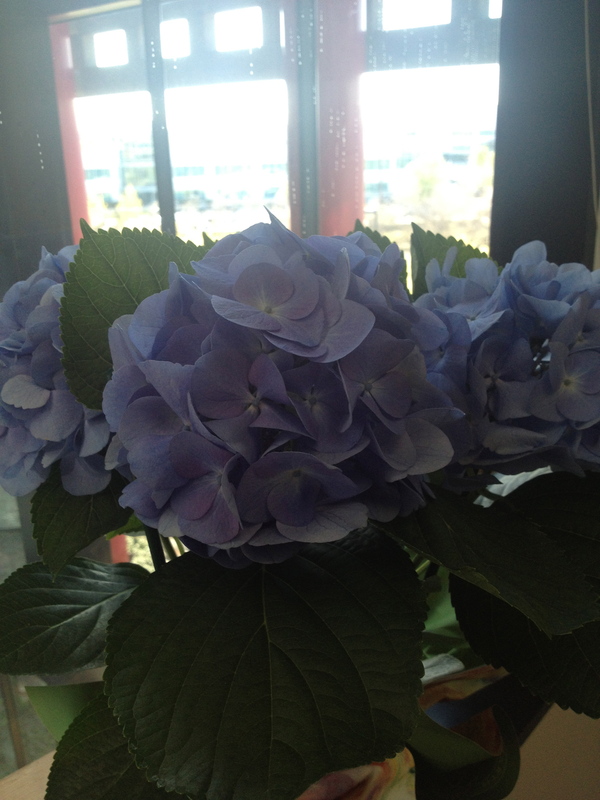 Since it’s so cold here right now, I’m keeping the hydrangea in my office. It’s so pretty and reminds me of the neighborhood where I lived in Toronto. There were a number of large hydrangea bushes there and a neighbor used to pick them and let them dry for winter arrangements and wreaths. The person who gave it to me suggested that I plant it in my yard somewhere shady where it can be watered frequently during the summer. I also need to make sure that if George finds it delicious that we won’t need to make a quick visit to the veterinary emergency clinic (what do you think Christine?). Note: This post was written Monday 3/25/13, but for whatever reason chose not to post. So you’ll see two posts today if you follow my blog. This entry was posted in Sow and tagged 3G Network, bruce, construction, dogs, garden, gardening, George, hydrangea, Julie Petroski, Mortroski Midcentury Urban Farm, north Texas, orchid, sow, Texas, violet, weather. Bookmark the permalink. I can never seem to match my coat to the weather. I’m always either under or over-dressed. Today I MAY have gotten it right. It was 7 celsius (46) at 6:00 a.m. so I wore a heavy canvas coat. Wish me luck. Good luck! I am freezing despite wearing thick socks and a sweater. I sure hope it gets back to normal around here really soon. Oh yes! 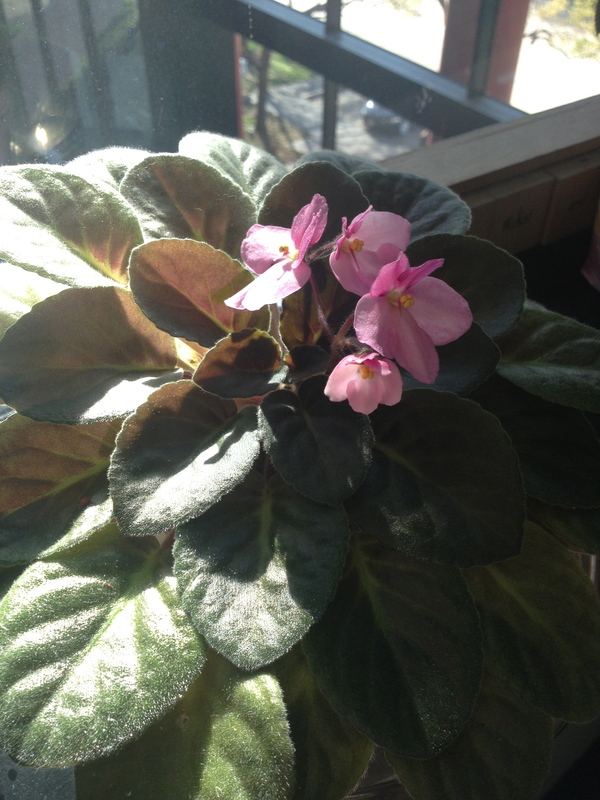 My little violet has perked me up on many icky days with a surprise bloom or new leaf. I love hydrangeas, especially the purplely blue ones. The colours of the flowers often depend on the type of soil they are kept in and its pH, I believe. So if you want to keep them blue you might need to make sure they have the right soil. it would be fun to change the make up of the soil to see the different colors! I’m a hydrangea fan too – they often revert to pale pink, and there’s an old wives tail that if you put rusty nails into the soil at the roots, it will keep the flowers blue – it must be to do with the iron.